Madeline has a playdate with a neighborhood friend almost every week. 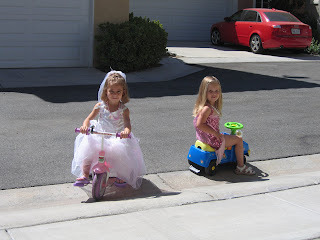 This week, they played in their pretty dress up clothes, rode the tricycle and car, and drew with chalk out in our cul-de-sac. 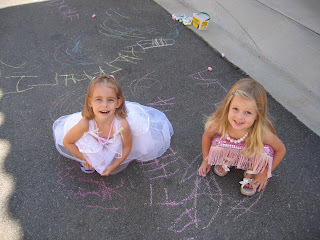 Sometimes they paint, play store, draw on the whiteboard or go to the park. We love having Kate come to our house because she is so sweet, loves Jesus and is a good influence on Madeline. 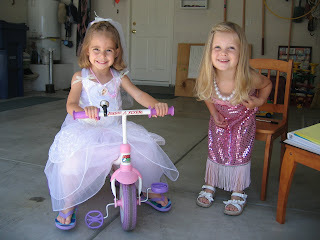 Kate and Maddie look so sweet in their beautiful dresses. I am so happy Maddie has a friend to play with. What fond childhood memories our Madeline and parents will have from these photos! Darling!